Social Media and privacy have been in the news and even on our own blog! If you want to learn about the origins of social media and how to protect your personal data, check out Social Media: What No One Has Told You About Privacy. This four-week course begins Wednesday, July 25 at 2pm and run weekly through August 15. This course isn’t a standard lecture-style class. It’s a learning circle, a lightly-facilitated study groups for learners who want to take online courses together, in-person. It’s kind of like a book group, but for people who want to take an online course in a group setting. 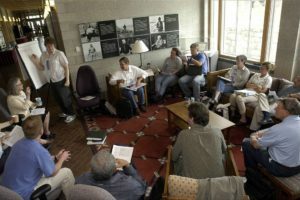 People attending Learning Circles gather at the library for 90 minutes, once a week, for four weeks to take an online course together with a library staff member facilitating each session. A learning circle group can help adults complete online courses, as it has the the potential to be the support system many learners need. However, there are several barriers. In order to succeed in learning online, individuals must already be web savvy, self-directed learners with a great deal of intrinsic motivation and discipline. Given this, it is not a surprise that the vast majority of those who complete online courses already have a Bachelor’s degree. The completion rate of MOOCs is very low. The average completion rate for massive open online courses is less than 7 percent according to one recent study. Intrigued? Registration beings on July 11. Please be able to attend all four sessions. Be sure to bring headphones to class as well!